Perhaps one of the nicest surprises I’ve had seeing a movie in theaters was realizing how short Liu Jian’s animated film Have A Nice Day (2018) is. Clocking in at a solid 77 minutes, it – along with films like Don Bluth’s The Land Before Time (1988) – is proof of how well-incorporated visual storytelling can work when dealing with lower budget animation. While it is preposterous to compare the animation technicals of The Land Before Time to Have A Nice Day, the style of the latter allows for a unique experience with a familiar neo-noir crime thriller story. 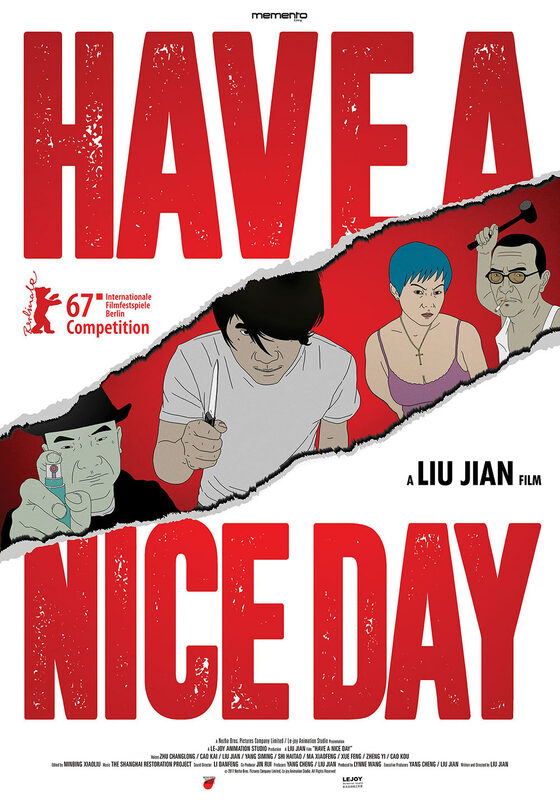 Countless examples of Have A Nice Day’s influences come to mind as soon as the film begins. A gang driver working around the construction sites of a sprawling Chinese city robs the crime lord’s courier of a bag filled with one million renminbi. The driver, named Xiao Zhang (Zhu Changlong), plans on using the money to go on a trip with his girlfriend to South Korea so she can fix her failed plastic surgery. His boss is intent on getting the money back and sends a hitman after Zhang; however, every other desperate slum dweller disillusioned and left behind by urbanization wants the money just as bad. As more and more people find out about the life-changing amount of money, the stakes and amount of violence for every person getting involved gets higher. Smoking is for bad guys. From the plot description alone, the film evokes the imagery of American crime films like No Country For Old Men (2007) and Pulp Fiction (1994). Liu Jian, who worked on this film mostly by himself, makes no attempt to hide this. Not only do characters name drop these films and others like The Godfather (1972), but Have A Nice Day lifts shots (read: paying homage) from these films and even has the posters for many other movies prominently displayed in the background. The posters for The Fast And The Furious (2000) and Rocky (1976) not only help add to the “lived-in” world-building feel – sold further by references to modern political events like Brexit – but serve to further the story in a uniquely visual way. At the risk of getting side-tracked by the notion of cyclic cultural diffusion – i.e. that these films themselves were also influenced by various Hong Kong and European crime films of the 1970s – the ultimate point is that the many average schmucks that find their way into the story consider themselves underdogs in the dog-eat-dog world of urban capitalism and dream of greener pastures (in one instance this is literal). This is not an original story by any means. I’ll give Jian credit for the strong stylistic elements that prevent Have A Nice Day from feeling like it’s just retreading familiar territory, but there are certainly enough recognizable and predictable story beats. It is without a doubt the animation style and the cultural self-reflection of the film that makes Have A Nice Day feel like a fresh experience. I joked before about this film’s animation being incomparable to that of Don Bluth’s, but they seriously couldn’t be any more different. 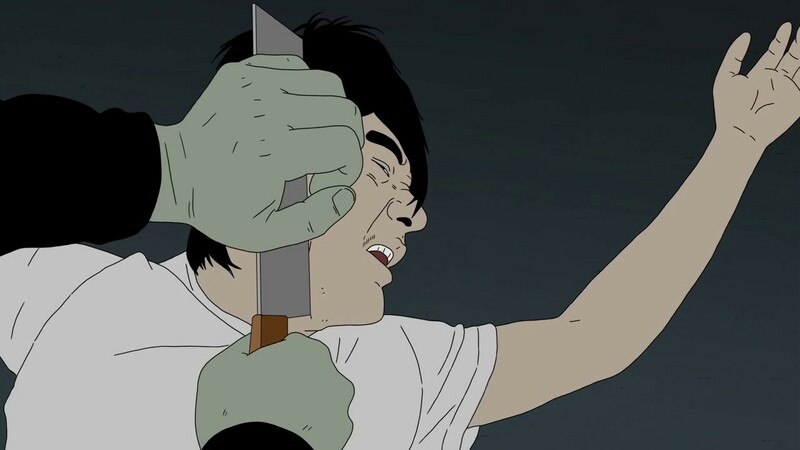 Jian is not trying to portray a melancholy or energetically animated world by any means in his darkly comedic crime thriller. His world is that of slums and an urban underbelly that has been left behind by the unchecked progress of capitalistic influence on China’s culture and economy. There’s a whole lot of the color grey, and other colors that find their way into frame are muted by the cloudy nighttime sky. It sells the mood perfectly. I don’t want to insult Jian’s work by saying his character designs are ugly, per se, but they look like graphic novel characters that move as cheaply as Adult Swim cartoons, which works for this kind of movie. I couldn’t help but be fascinated by their jerky movements and the weird inclusion of detail on certain aspects of their bodies. There’s a scene in which a hitman is punching someone out of frame and his punching animation is literally two frames. When you’re watching a neo-noir crime film you expect things to be gritty and gross-looking, and you get that with every detail in the setting and the characters. The irony of needing money to leave one’s life behind to achieve the communist dream. It’s strange that a film barely 80 minutes long somehow manages to feel longer than its runtime, while having a script that feels incomplete. I certainly enjoyed the lack of mood-carrying music and the slower moments and transitions that pace out the film brilliantly, but too many characters feel forgotten about or just completely dropped after they fulfill some sort of story purpose. Two bored upper-class kids in one scene and a frustrated billiards hall-manager and his girlfriend in another open their respective scenes with some great theme-building dialogue that establishes their motivations for going after the money and how they heard about it from someone else they know (everyone in this film is related to each other in some manner), but they get lost in the Tarantino-esqe shuffle of characters as the story builds to its climax. It’s a shame that a film this legitimately interesting and enjoyable couldn’t have tighter writing to push it into the upper echelons of the genre, but I’m sure given the limitations of what Liu Jian was working with for three years that he did what he could and had to cut some corners. Have A Nice Day is certainly worth your time as a solid crime film that is cleverly blended with traditional and communist-influenced Chinese culture. A uniquely interesting neo-noir crime thriller that utilizes its low budget animation to great stylistic effect. Even though it’s nice to watch a short movie every now and then, this element works against the film, as side characters and side plots get carelessly dropped after their usefulness in advancing the story is done. Thankfully, the film’s slower moments are saved with anti-capitalistic themes expressed through visual excellence. Next Next post: Molly’s Game (2017) Review: Ambitious, greedy, and roaring fun.